JUDGE A. G. HENRY. Our subject is one of the venerable men of Bond County, for nearly seventy years have left their record upon his head in whitened hair. However, he retains his honorable position by virtue of his keen ability and well-preserved physical attributes. He is a large land-owner in the county, possessing at the present time something more or less than a thousand acres. Our subject was born in Bourbon County, Ky., February 28, 1824. He is a son of John and Betsey (Mills) Henry, natives of South Carolina and Kentucky, respectively. John Henry was a carpenter by trade, and followed his calling for a number of years, but finally gave it up in favor of farming. When a young man he was engaged at his trade in Kentucky. He came to Bond County, Ill., in November, 1827, and taking up Government land settled on Beaver Creek, where he remained until 1852, and then removed to Texas. Ten children made the house and home of John Henry and his wife a scene of busy activity. These were all born in Illinois except the two eldest. Six of them are now living, our subject being the eldest of the family. John Henry, while in Texas, was very extensively engaged in farming. He returned, however, to this county in 1859 and here died. His wife still survives and resides here at the age of ninety years, having celebrated her last birthday in May, 1892. Our subject was reared on the home farm and received the advantages of a fair education. After remaining at home until twenty-six years of age, he spent one year in the North. Prior to leaving home, he studied law and was admitted to the Bar in 1853. He commenced his practice in Bond County and has followed it ever since. In connection with his profession he has had large real estate interests. As before stated, he owns one thousand acres of land in this county, all of which is under cultivation, and he also owns large tracts in other counties. He is one of the Directors of the Vandalia Railroad. The first office to which he was elected in this county was Justice of the Peace. In 1872 and 1874, he represented Bond, Clinton and Washington Counties in the State Legislature. In 1848, our subject married Miss Mary Hull, of Bond County. She is a daughter of Benjamin and Lucinda (Allen) Hull, natives of Tennessee and Indiana, respectively. Of the two children born of this marriage that are still living, Eliza, who is now Mrs. Berry, of Pratt, Kan., is the mother of four children, whose names are Nellie, Nonie, Caroline and Henry. Lucy is Mrs. T. P. Morey, of Greenville. Her two children are Henry and Louise. Judge Henry lives in his own residence, which is a fine brick house, imposing in style and structure. It has handsome grounds and its furnishing is characterized by the idea of comfort rather than of useless elegance. Judge Henry has always been a worker in the cause of the Republican party, although he can never have been said to be a politician, leaving that to men whose individual interests demanded less time than his own. 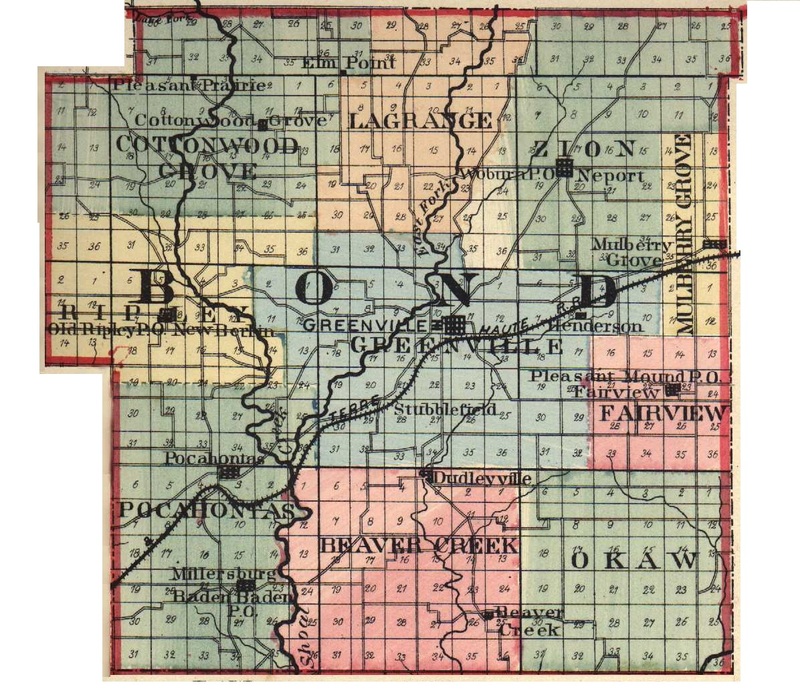 Extracted 04 Dec 2016 by Norma Hass from 1892 Portrait and Biographical Record of Montgomery and Bond Counties, Illinois, page 255.